This article, the video and the podcast accompany the Women of Mathematics photo exhibition. You can download Carola-Bibiane Schönlieb's exhibition poster by clicking here. To see more profiles of female mathematicians and to find out more about the exhibition, see here. Photographs by Henry Kenyon. Watch the interview with Carola-Bibiane Schönlieb in this video! Carola-Bibiane Schönlieb is a Reader in Applied and Computational Analysis and Head of the Image Analysis Group at the Department of Applied Mathematics and Theoretical Physics, University of Cambridge. Plus: How and when did you chose to do mathematics? Carola-Bibiane Schönlieb: I went to school in Austria, in Salzburg, to a gymnasium which is like doing A-levels here. Actually the gymnasium I was at was specialised in languages, which it turned out I really don't have a talent for. So I was always quite interested in mathematics and I guess I was just reasonably good at it during school, so it was a natural choice for me to do it at university afterwards. Plus: You say you're not a pure mathematician. Can you explain what your area of mathematics is about? 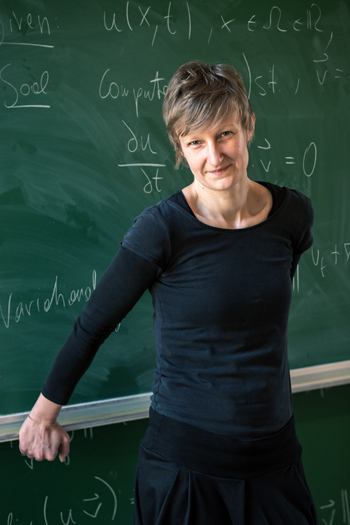 Carola-Bibiane Schönlieb: My background is in partial differential equations. I use partial differential equations and so-called variational methods in optimisation problems. I use these mathematical tools for inverse imaging problems, meaning that you have either a measurement of an image or you have an image itself and you would like to extract some information from these measurements. For example, think about image denoising: you're measuring a noisy image and you want to compute a denoised image. Or it could be you that you're not interested in the whole image, but you want to segment [isolate] certain parts in this image. Plus: Could you tell us one of your favourite mathematical moments? Carola-Bibiane Schönlieb: I think there are many and very different moments that you experience during your research. I think really the best mathematical moments appeared during my research work. I don't know if there is really a best one but what I appreciate a lot is this process when you start thinking about something and it takes you a long time until you understand it. This is often a kind of torturous process — so this is one of the challenges, I guess, of being a mathematician, that you are always faced with these really difficult problems. But then, this moment when all of a sudden you get an idea in this process of trying to understand the problem and finding out how to solve it, you get an idea and then follow this idea through and see that it actually works, this is really cool. Plus: A related question: what are the joys of doing mathematics and what are the challenges? Carola-Bibiane Schönlieb: I think the joys are when you succeed. When you succeed and when you see that what you have done is interesting, not just for you, but for other people. So you go to conferences and you present what you have done and people are excited about that, people read your papers and you get emails saying, "Ah, this is really interesting. Have you thought about this or this?" This is something that I enjoy quite a lot. I also enjoy a quite a lot to work with students, in particular doing research with students. Actually, collaborating in general is a wonderful thing for me in mathematics, especially if you meet people that are on the same wavelength as you are and that are complementing you, so you can discuss mathematics very freely. Discussing mathematics I think is something very personal and you really need to trust the other person to openly reveal that you have no idea about something. I think only this way can you make progress and actually solve problems. But this collaboration and this personal level about mathematics I like a lot. The challenges I think are that we really have to work on very hard problems and you need a lot of patience to do that, and you need a lot of confidence, which is often not so easy. So you have to deal with the fact that sometimes you might not be able to answer a question just like that. Maybe you will answer a question a year after you have started thinking about it, maybe you have still not solved it now. I think this is something that is challenging on a very personal level because your research is your research and it's your question and it's you who has to solve it. If you can't solve it, you still should keep believing in yourself. So I think this thing with confidence is a very important challenge to overcome and to get to know your own strengths and your own weaknesses and to really exploit your strengths and maybe work a bit on your weaknesses. Carola-Bibiane Schönlieb: When I was doing my undergraduate studies I didn't realise at all that gender makes a difference and I really never thought about it. Then when I started to do my PhD I for the first time was sharing an office with another female PhD student. Then I thought, "Well, this really makes a difference. It's really nice to not always be the only one." So this is one thing I think that we should pay attention to and this is one of the key reasons why it's important to increase the number of women in mathematics, because it changes the environment. It's just nice not to be a singularity all the time. Plus: What advice would you give to a young woman who wants to become a mathematician? Carola-Bibiane Schönlieb: An important thing, as I said, is to get to know your strengths and to believe in your strengths, and to accept your weaknesses and don't pull yourself down for your weaknesses. I meet so many female mathematicians; students and also women who have already achieved a lot, who still think and still say that they might not be good enough. This really kills you if you don't get rid of it, and there is no reason to believe that actually. Everyone has their strong points and their weak points and I think this is just something that we have to overcome to focus on the strong points, and then just go for it. One other piece of advice I would give is planning your career. Again, I only know this of women, that there is this bad conscience about following your career and leaving family behind — you don't leave family behind, but there is this bad conscience if you want a career. Just yesterday I met a colleague of mine who is an assistant professor and a woman and her husband has been taking care of their child for the last two years, so he was the one who stayed at home. She said she still has a bad conscience because of that. Just get rid of the bad conscience.